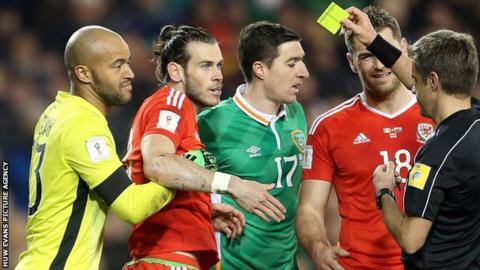 Former Wales goalkeeper Neville Southall says the team's struggle to qualify for the 2018 World Cup is due to teams nullifying Gareth Bale. Bale returns after suspension to face Austria in Cardiff on 2 September, then Moldova three days later. "Gareth hasn't done as well as the last (qualifying campaign)," said Southall. "And that's nothing to do with his performances, it's because people have recognised what a massive problem he is to other teams." Bale, 28, scored seven of Wales' 11 goals during qualifying for Euro 2016, to help them secure a place in the finals of a major competition for the first time in 58 years. Chris Coleman's side reached the semi-finals of the tournament before losing 2-0 to Portugal in Lyon. Since then Wales have won one and drawn five of their six qualifying group games for Russia 2018, but Real Madrid forward Bale returns after missing the 1-1 draw with Serbia in their previous game. "Gareth's performances in the run up to the last Euros were the best I've seen of any Welsh player," said Southall, 58, who is Wales' record cap holder with 92 appearances. "He produced more in that qualifying group than anyone I've ever seen anywhere. "When we needed him, he just came out and produced something out of nothing." Chris Coleman discusses his future as Wales manager, hinting he has not ruled out staying on past the 2018 World Cup campaign. Wales remain unbeaten in their current qualifying campaign but sit third in Group D, four points adrift of automatic qualification. "It's a slight hangover from the last one," said former Everton goalkeeper Southall, who won two First Division titles and two FA Cups in his time at Goodison Park. "It's hard because once you go to that tournament no one's ever taught them how to feel afterwards, because we've never been there before. "They're feeling their way from doing fantastically well, to struggling a bit. They haven't done badly, they just haven't done great." After the home game with Austria at Cardiff City Stadium on Saturday, Wales travel to face Moldova in Chisinau three days later. "They have to win most of their games now to qualify. For that you need Gareth Bale firing on all cylinders, (Arsenal midfielder Aaron) Ramsey firing on all cylinders and you need the team to perform," Southall said. "It's a fresh start and they believe in themselves which is important. They've got to believe that they can get through. "We've got one of the best players in the world, so we've always got a chance of qualifying." Reading's Chris Gunter, Wales' third most-capped player behind Southall and the late Gary Speed (85 caps), will win his 80th cap should he play against Austria on Saturday. And at 28 years old, the right back poses the most credible challenge to breaking Southall's record. "I hope (he does), because he's been fantastic," added Southall. "He's played well in every game; you don't see him have a bad game. "He's a model pro. He never does anything wrong. "He's one of those players that goes unnoticed all the time. That's how good he is. Sometimes you don't know he's there. He just keeps going and gets better and better. "I'll be happy if 10 people pass it, 15 people. That means we're getting more and more games in, the quicker they pass it the better it is. That means we're qualifying for tournaments."